For those who may have noticed, I've taken a break from my regular blogging for the past couple of months as the new year has proved to be particularly demanding on my time and energies. I'm prompted to start again now having spent time this week with Michael Fullan at a number of events, in particular, the launch of an exciting project involving a cluster of seven schools in Christchurch as part of an international collaboration under the banner of New Pedagogies for Deep Learning. New Pedagogies for Deep Learning is an international innovation partnership involving students, teachers, school leaders, families and education communities working together to address a key education challenge: how to design teaching and learning that leads to more successful lives for all students. The project is based on the work of Michael Fullan's paper A Rich Seam: How New Pedagogies find Deep Learning (PDF download). The Christchurch cluster will be working in close collaboration with around 80 schools in Victoria and another 20 in Tasmania, Australia, which in turn are a part of a larger group involving over 300 schools in nine countries so far. There is a growing sense among education leaders, educators, students and parents that traditional approaches are not delivering the necessary outcomes for all students to flourish in the increasingly complex world in which they live. Education is at a major turning point with a powerful push-pull dynamic at play. Push being that traditional school is too often boring leaving students disengaged and pull that the digital world is exciting and ubiquitous. All students need to be able to flourish and positively solve life challenges and problems important to them. Equipped with new pedagogical models, a growing digital ubiquity and new learning partnerships, students will shift from learning about life to learning being living. All students need to be able to flourish and positively solve life challenges and problems important to them. Equipped with new pedagogical models, a growing digital ubiquity and new learning partnerships, students will shift from learning about life to learning being living. Over the next 2-3 years the Christchurch schools are going to be exploring together how they can create far richer, relevant and engaging programmes of learning for their students, involving new approaches to using technology to support learning, new approaches to planning, learning and assessment, and now approaches to leadership across the cluster at all levels to support what is happening. I'm looking forward to an exciting time working with them. 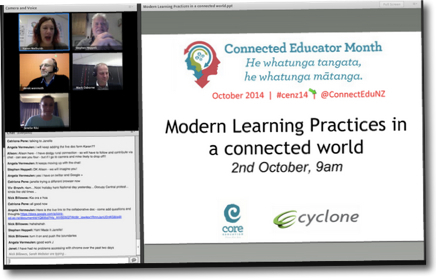 This morning I had the privilege of joining a panel to present on the theme of modern learning practice in a connected world as a part of the Connected Educator Month here in NZ. Joining me on the panel was a very old friend from the UK, Stephen Heppell and colleagues from CORE, Mark Osborne, Janelle Riki and in the chair, Karen Melhuish Spencer. In this post I don't intent unpacking what was said or the ideas that were discussed – if you want to know that then the recording is available here and the thoughts of the participants are captured in a shared Google Doc here and on Twitter here on #cenz14. All has been captured in Storify by Marnel van der Spuy. As the presenters were sharing their ideas in the session there was a constant stream of 'soundbites' being captured and shared via the chat facility in the Adobe Connect environment we were using. Each of these represented the key idea or important concept captured by an individual participant – and collectively, they represent the key messages of the experience, there for everyone to review and construct their own memory of the event from. Imagine if we had this sort of facility in our classrooms – where we were intentially capturing the ideas that are regarded as significant in the minds of each learner – and see them shared in this way so that what escaped the attention of one, is picked up by another etc. Seems to me there's something quite powerful in recognising and understanding the usefulness of this activity in the knowledge building process – recognising of course that it's a part of the process, and that there's a lot of revisiting, filtering and connecting of ideas that will need to occur yet. But at least it is captured – and accessible in a way that previously we've missed out on in our classrooms. The Google Doc provides a different level of engagement. Here we saw the knowledge base grow before our eyes during the presentation – and it continues to grow and develop afterwards as there are people active in it even as I am writing this post, editing and playing with the format etc. The level of engagement here goes beyond the simple soundbites (although these are recorded at the bottom of the document) – and makes lots of use of the links that were shared during the presentation to add substance and value to the soundbites used – offering opporutunities to dig deeper into the concepts and ideas. The Google Doc also remains as an archive of the event and the knowledge shared within it. This is a strategy that we're certainly seeing deployed in some schools – but there's room for far more of it! The ability of learners to use an online environment that is accessible from anywhere and at any time to share ideas and co-construct knowledge in this way must certainly come to feature as a 'must have' in the repertoire of any modern teacher. I also saw the start of some thinking that represents the metacognitive engagement – where questions were being asked in response to something that was said by a presenter, or where such thoughts or 'sound bites' stimulated another level of thinking in a participant. The use of the backchannels to immediately enable people to deal with the questions they have or dilemmas in their thinking is extremely powerful to the learning process – particularly as they are able to be responded to by the community, and not wait in line for the presenter to respond. A counter to this is often cited from some who see this sort of activity as a distraction – preferring that everyone focuses on what the presenter/teacher is saying. I concur that it can be a distraction – but I also believe that dealing with distraction and making the right choices about when and when not to engage in such activity is a part of learning to manage self – an important skill for our modern learners and teachers. The fact is that for many, having the question buzzing around in your head as a result of something the presenter says can be a distraction in itself, and creates a 'block' to full engagement until it has been answered or responded to. So my point is that the CEM experience this morning has powerfully reinforced for me again the need for us to consider, plan for and embrace the multi-dimensional experience that learning can and should be in (and out of) our classrooms. If you aren't already connected – take a look at the variety of events and opportunities that are yet to come through the rest of October in Connected Educator Month. if searching the calendar of events isn't your thing, you can sign up fo regular updates. One of the things I've had the privilege of contributing to in terms of the organisation is the upcoming Connected Educator Month which will launch here in New Zealand for the first time this year. My colleague Karen Melhuish Spencer (in the video above) has done an outstanding job leading the organisation from the NZ end. Connected Educator Month began in the US two years ago, using online communities help educators share effective strategies, reduce isolation, and provide "just in time" access to knowledge and expertise. In 2013 nearly 200 educational organizations participated in Connected Educator Month in the US, providing a variety of interactive activities, such as webinars, live chats, open houses, contests, projects, and badges for connected educators to earn. This year we are bringing the opportunity for teachers to participate in these sorts of professional learning experiences to New Zealand – joining with the Connected Educator teams in the US and Victoria, Australia, to make this a truly global event. To find out what's available, check out the Connected Educator Month group on the VLN for more information, and the Calendar of Events on the Connected Educator websites. The calendar provides you with the opportunity to contribute workshops or events if you want to also – great for those in our education community who are doing some great work in their schools and who can share these experiences so that others can learn from them. You can also check out what's happening in the US Connected Educator Month calendar and joing those events if you wish. 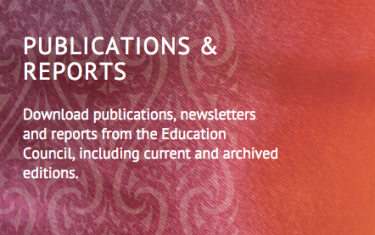 Because Connected Educator Month is being run in October across all three countries, we're also integrating ULearn into the month, with several workshops and events there being shared as a part of the month's activities. Collaboration is a hot topic in many areas of education at the moment. My work in describing and explaining the key changes for teachers as they develop their Modern Learning Practice places this pretty high on the list. So too with the work I'm involved in my home city of Christchurch, as school leaders and the Ministry of Education seek to explore more collabortive forms of 'school' and 'schooling' as they rebuild after the earthquakes here. in the video interview above, New York University professor and author, Clay Shirky, explains the disruptive impact of technology on how people live and work. While his comments apply much more broadly than the education space, the principle of collaboration being a disruptive influence apply. What I get from this interview is the fact that we need to understand collaboration as an organic activty, not something we try to create policy and structures around, and expect to happen. If we want promote true, engaged collaborative activity, we can do things that will create the environments that will encourage it (Clay's focus in much of his writing is on the way social media environments enable this to happen), and we can also incentivise collaborative behaviours (by re-examining the things that are 'measured' in our system – e.g. ERO criteria etc. ), but little is likely to happen where we simply announce a mandate that we must all collaborate. This applies within schools where principals and school leaders implement new forms of collaborative teams as ways of organising staff, as well as externally – for instance, the organisation of schools into clusters. The second key lesson from Shirky is around the way in which collaborative groups can create success from failure. This isn't likely to be the case in 'enforced' or 'organised' collaborations where failure is often interpreted as a reason to stop collaborating. In a more organic collaboration, failure drives the group to find alternative solutions – ideas that may not have emerged otherwise. Of course the critical thing to consider is that collaboration is the polar opposite of competition, and we currently work within a policy and resourcing environment that promotes, encourages and rewards competition in our schooling system. Until there's some serious work done to change those drivers, then collaboration is unlikely to have a lasting impact at a system level – however, it may be the thing that convinces those in decision making positions to do so! The Superloop Forum was formed in 2007, following the allocation of funding to five regions in New Zealand from the Broadband Initiative Fund (BIF). The forum exists as an informal affiliation of those associated with and representing the emerging networks of schools being connected by UFB infrastructure. Their mission is to facilitate cooperation and collaboration between clusters of schools in deploying and using UFB networks to enhance learning. The link titled 'building regional capacity' contains the text of the submission that the Superloop forum made to the parliamentary select committee on 21st century learning environments and digital literacy. This website presents an overview of the activity that is occurring in various regional areas of New Zealand, both urban and rural, in terms of schools and clusters making use of the connections they have to ultra-fast broadband. It is really pleasing to note that the VLN is a part of this network – representing over 200 schools alone! By clicking on any of the circles surrounding the NZ map on the front page you can view more details about each cluster, including the numbers of schools involved and links to the cluster website (where it exists). In addition to the website, there is now a group on the VLN for the Superloop Forum, which anyone who has subscribed to the VLN can join. this is where those involved in the Superloop forum can share ideas and resources as the community grows and develops. I've been following with interest all of the activity in the US where they're celebrating Connected Educator Month through August, an initiative aimed at strengthening connected online communities of practice in education. The notion of online communities of practice is nothing new – but interest and participation in them has increased markedly in the past year or so as educators are discovering the huge benefits that lie in being able to link with and learn from each other in these sorts of environment. In NZ, participation in the VLN, for instance, has be increasing exponentially during that time, and, of course, as more people join and participate, the greater the body of knowledge and shared experience that is available makes it attractive to even more to join. Until now, participation in these sorts of things has been regarded widely as purely optional, and for the 'enthusiasts' and early adopters. But the tide appears to be changing, with some arguing that connectedness should now be the standard, and no longer an option. So what is the appeal of being 'connected', and why are so many people suddenly taking an interest? In a recent article titled why educators should connect digitally, Tania Roscoria identifies professional development as a key theme. Increased costs associated with traditional forms of PD, the time it takes to participate, the difficulty in getting access to customised or tailored activities etc. etc. are familiar conversations in school staffrooms, and it would seem that there is a dawning realisation that these online environments provide opportunities that are of significant value as PD, as well as meeting expectations in terms of content and relevance. On top of that, participation isn't passive – it's highly contributory, where the expertise and experience of members is recognised and valued by others in the community. Our communities of practice come in a variety of shapes and sizes. Curriculum Team Leaders, form the core of a group that meets weekly to learn together with other school leaders. They take the learning back to their co-teachers and bring back feedback from teams. These meetings have become a forum for shared reflection and for exploring new ideas. Teachers are encouraged to share their own learning and expertise with their peers. Collaborative grade-level teams meet regularly to share practice. Each term, there is a flexible PD schedule and team leaders record their teams’ needs and ideas for how best to utilize after-school meetings times. I completely concur. In my own work I've become increasing involved in using online community spaces as a focal point of the work I do with teachers and educator groups. I've recently begun a programme for a group of teachers in Christchurch titled 'emerging eLeaders' that has attracted a number of teachers who haven't previously been involved in learning this way, but who have been attracted to it because of the limited opportunities available to them through traditional approaches. Already in this group the sense of 'connectedness' is evident as participants have begun sharing thoughts and responses raised in our first meeting together, and respond to the challenges that have been posed. Of course, online communities don't just 'happen'. There are some new skills and knowledge to be developed in order to adapt our facilitation approach and design these experiences. So too, there is a huge emphasis on participants taking responsibility for being active participants – with out that the community will languish and fail. There's plenty of help available for people wanting to make a start here – this week I came across an enormously useful set of links and references on How To Build An Online Community: The Ultimate List Of Resources (2012), put together by FeverBee founder Richard Millington. There's a plethora of great information here, starting with readings about the background and philosophical frameworks for online communities, how to establish then run and manage these, to measuring the effectiveness of them and the value they are providing. My final comment piece of advice is – while reading about online communities and being a connected educator is very useful and an important thing to do, nothing can beat actually DOING it, so step out and have a go at participating in some of these online groups and environments, and combine your head knowledge with your practical, lived experience of being an online community member.